Hi everyone - I'm back! I hope you all enjoyed the posts that I scheduled while I was away, and please let me thank those 15 wonderful Aussie ladies who were guest bloggers while I was away. 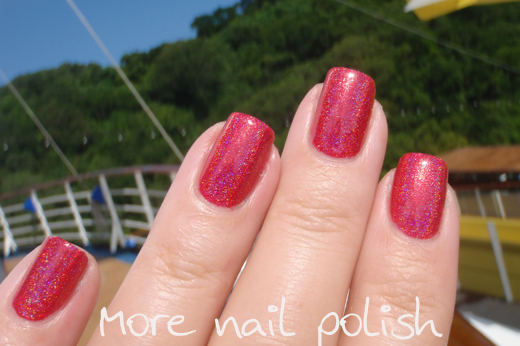 Tonight's post has a few quick holiday snaps, plus some manis that I wore on my holiday. 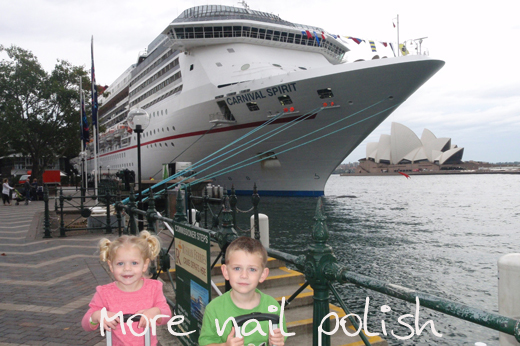 Here are the kiddos, first day after boarding the ship, and then on the last day after getting off. I took around 10 polishes away with me (as one does when they will be away for 11 days), included in those were handful of Emily de Molly holos, but only ended up wearing three of them. Two on my fingers and one on my toes. In fact I only ended up changing my mani three times!! I'll do proper swatches of these later, because these aren't by best swatches. I didn't take a clean up brush away with me, so these were carefully painted with no cleanup - and let me tell you, it's pretty bloody tough painting neatly in 3 meter swells. 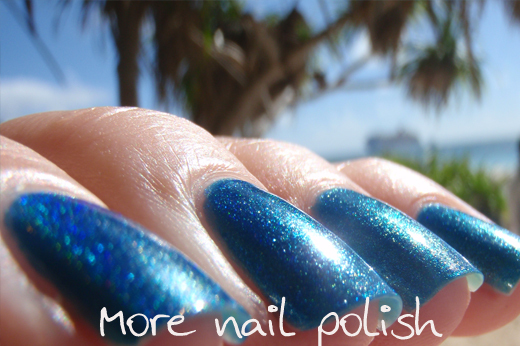 The red polish is Emily de Molly Seeing Red and the blue one is Indigo Flow. This is the day we were at Mystery Island off Vanuatu. Warning - feet shot coming! 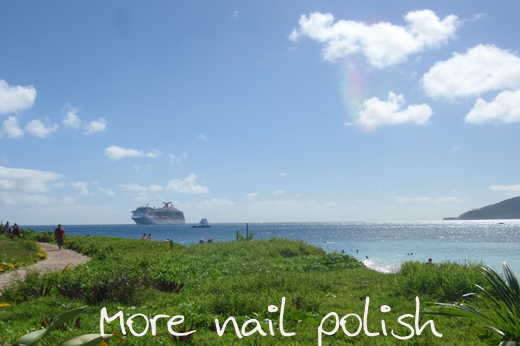 I was trying to get a nails and ship shot here, you can just make out the blurred ship in the background. 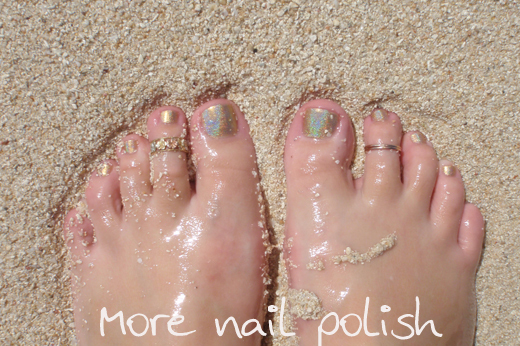 On my toes is Emily de Molly High Distinction - it was the perfect sparkly colour for putting your toes in the sand. 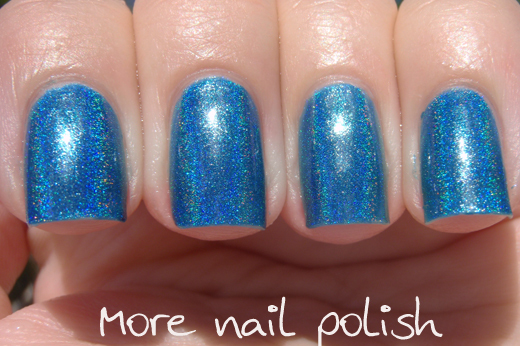 I also wore one of my Layla Soft Touch Effect polishes. 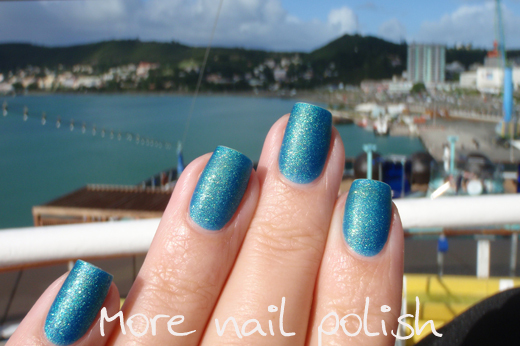 This one was Turquoise Splash. I loved that these are well pigmented, and dry fast. 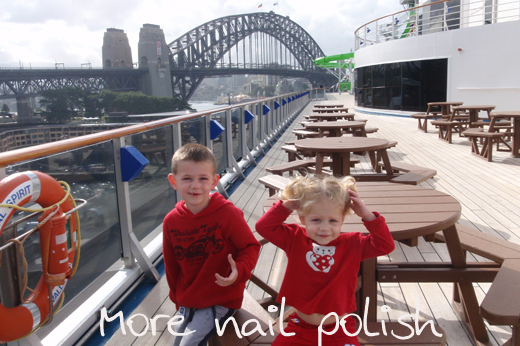 Because they have a soft satin / matte finish, you don't need top coat either. Thanks for sticking around, and I'll be back with my regular scheduled programming from tomorrow. LOL - I wasn't sure if I should put them in, feet freak some people out - but I was bare foot a lot of the time and really loved the polish colour! Oh, and I definitely have thumbs and a right hand too ;) In fact, after my holiday, my right hand is looking mighty fine! I might be able to do left and right hand swatches for a bit. Oh, I'd love to see more vacation pics. I'm so jealous! Welcome back!!! Sorry but I have to say that at least, I didn't miss you! You picked some excelent guests with lovely designs... It was a pleassure to keep reading your blog while the girls did their magic! Hope you had a wonderful family time!! !